Hello, everyone! One of the hottest trends right now is ruffles… we are seeing them everywhere!!! Ruffles instantly add movement and femininity to any outfit! This Serendipity Ruffle top is one of the newest arrivals from my clothing line. It’s a super cute, versatile top that can be dressed up tucked into a skirt or down with jeans! You also might’ve seen it featured in the latest edition of StyleWatch Magazine! What’s your favorite way to wear ruffles?! What a pretty top! I love this outfit! It is casual but very feminine! Love the bag, so chic and summery! Enjoy your time in New York! — Soraya/ – Also were can I find the black wedges you posted on Instastories on Inspiration? Love this new top, Rach!! You’re killing it with your clothing line! I seriously fall in love with every single piece and wish that I could have them all in my closet! I absolutely love this top! The color is beautiful and the ruffle detail is so fun! Hello Rachel. I just wanted to say how much I look forward to your posts. You and your family couldn’t be cuter. I love your house and all of your clothes. Although I only have a TJ Maxx budget, I do you like to see you what is popular. Thank you for sharing your time and talents with the rest of us!! I love this top! So cute. What a lovely top! I adore the color and ruffle combination, which makes for such a feminine and flirty piece, perfect for spring and summer! Congrats on having it featured in Style Watch Magazine, that’s awesome, girl! Thanks for sharing and I hope you’re having a great week so far; enjoy your time in NYC! 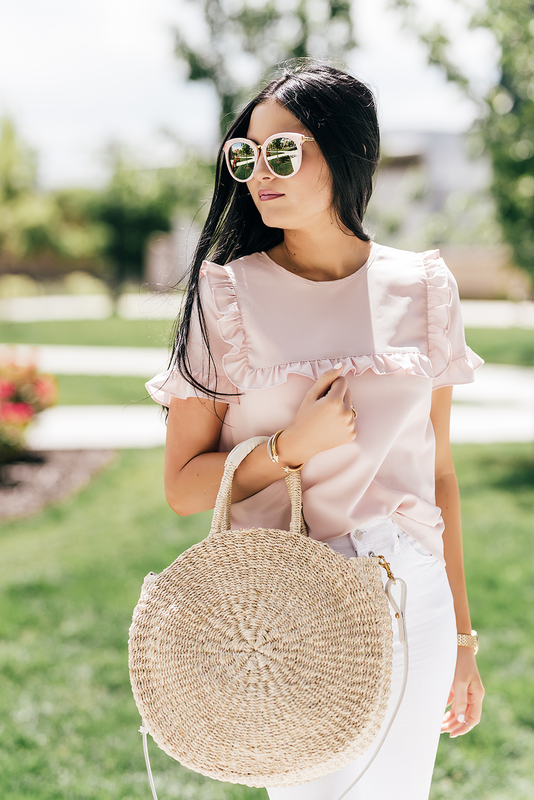 I’ve been eyeing this pink ruffled top from your line for a while now, I’ve got to get it! Love the ruffles and the light shades of pink. Such a cute summer look! I love the white paired with the light blush. Such a pretty color combo, especially with your hair coloring. I also love the ruffle trend this year! So fun! I love those shoes! I’m also so into ruffles right now too. Absolutely love that top! You look so good Rachel. Love this outfit on you, especially the bag! I love the flowiness of this top! And of course the ruffles are my fave and the blush color! Such a beautiful top! Love your basket bag too! One of my favorite summer trends! I just got a cute one from J.Crew! Ruffles are my FAVORITE trend this season! So pretty on you! Love the color! Pink is such a hard color to wear for me. It looks really great on you! Omg this ruffles tee is so perfect and girly and so pretty for any day!! Love your top! I really need to get on the pink and white bandwagon. Love it for summer! This is such a cute top and beautifully paired with the jeans and sandals! Love all the blush pinks together – so cute! I totally adore your fashion sense, I love your outfit here. Especially your bag, wooww! Thanks Sharan, I know I’m kind of obsessed with it! Such a great outfit! May I ask what size you are wearing in your top? And are the sandals true to size? Some of the reviews I read online for the sandals said they run big. Thanks! So I’m usually a 7, but I almost always get a 6.5 in Stuart Weitzman shoes. But the 6.5 were too small so I had to order a 7 too! I would say size up half a size :) And I’m wearing a S in the top! Hope this helps.